Serving the people of Pierce County: Tacoma, Unincorporated, Lakewood, Puyallup, Gig Harbor and more. Community forum on April 28, 2018 at Tacoma Convention Center. This page has power points, pictures and evaluation information from the forum. Check out the follow-up presentation to Pierce County here as well. Interested in joining a group to read and discuss stimulating books? League Book Group meets every first Thursday of the month at 2:30 pm, Wheelock Branch Library, 722 North 26th Street, Tacoma. The winner of the League of Women Voters of Tacoma-Pierce County's 50-50 raffle drawing, June 9, 1:00 pm, is JUDY DAVIS, TICKET # 100240. Each month, one of our members submits a brief book review to be published in the Voter. The following list provides ideas of books that may be of interest to League members and others. Take a look at our Voter for additional book ideas. 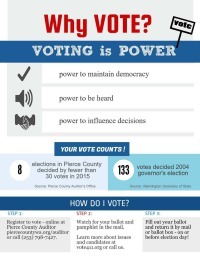 The Tacoma-Pierce County League of Women Voters is dedicated to making democracy work by growing, mobilizing, educating and protecting the vote. Our current work is highlighted on this page; other pages have additional background and information. You don't have to be a League member to participate! Join one of our unit meeting discussions on timely issues; attend a forum; talk to people you meet there - and see if you like it. We welcome the public at all of our events. The very popular forum series on Civility, Incivility and Civil Disobedience has now concluded. You can watch the premier forum, "Civility, Whose Role Is It Anyway? ", which was on February 4, at https://www.youtube.com/watch?v=LveGSmnVJJs&feature=youtu.be. Amy Young, PhD, Professor at PLU, opened with an historical perspective. Read Amy's speech here. Suggestions for new forum topics can be sent to Action Chair, Cynthia Stewart, stewdahl@comcast.net. League members have been working hard visiting high school civics and social studies classes to discuss voting rights and registering eligible students to vote. 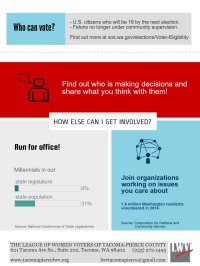 Take a look at this infographic being used in the schools. Disclaimer: All links to other web sites are provided for your convenience only. 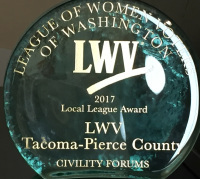 The League of Women Voters of Tacoma-Pierce County exercises no control of the information or opinions contained on them. Provision of these links on our site does not indicate an endorsement of their contents by the LWV of Tacoma-Pierce County. Last revised: April 9, 2019 13:00 PDT.